Ulthuan • View topic - In the Mists and Shadows of Yvresse. Post subject: Re: In the Mists and Shadows of Yvresse. 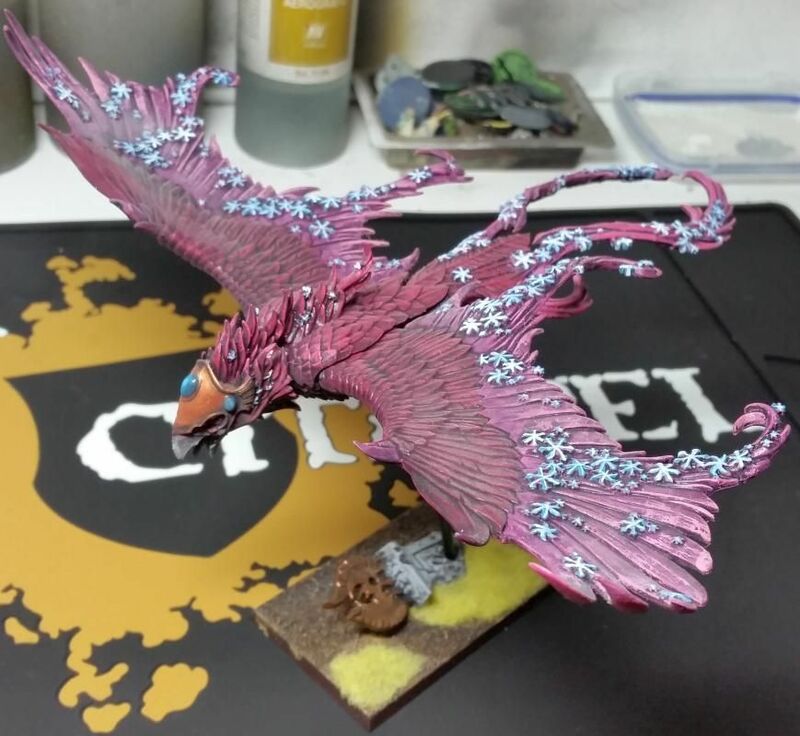 The phoenix is finished, the matt varnish did the classic white effect. This is QLD, and humidity is the worst. Well, if it's going to do that I guess better on a frost than a fire. And in the pictures it's hardly noticeable. When you do get a low humidity day sometimes you can take care of the frosting by simply hitting it again with the same varnish. Yea I don't hate it enough to fix it, it's on the shelf with the rest of the army until I need to get some of it down for a 9th Age event in March, and a classic 8th Ed event in May. As the others said, it actually gives an interesting frost effect to the model, though that could be the picture. I like him (it?). The pink and blue/white work very nicely together. Perhaps some of the details could have used some more attention. But that usually means a lot of extra work for small improvements. The Pareto principlealso applies to painting miniatures. The event is tomorrow lads, I based the White Lions, and they have movement trays now too. My first match up is Chaos Dwarves, and I have a DragonMage, so I'm screwed. If it's cannons you're worried about, remember that obstacles stop them and you could even shelter behind a unit (hoping some brave spearmen stop or at least slow down the cannon ball for instance). Also, if you pivot the base sideways you reduce the to hit area, making it slightly more likely to be missed by a cannonball. And since it's a single model you don't suffer in the movement department (since you can simply pivot for free and move forward as needed). Also of course, Fireball FTW! Good luck in the tournament and have fun! The DragonMage was awesome! I slept in and missed the first match, then played the bye buster, so I of course gained points, and then I got smashed by some gorgeous daemons. He is at least 2++ vs Flaming, though I guess his Dragon isn’t. then I got smashed by some gorgeous daemons. It sounds like you had a blast. Which is what counts. Any chance of some pictures or battle report? I only took seven photos, and as a learning experience that's a poor effort. There is an 8th Ed event next month, I'll take more photos at them. This 9th Age things is going to be seasonal, there will be another in three months, which I'll be better prepared for. In my experience the damn gameplay always gets in the way of tournament photography. The 9th Age events are going to be a seasonal thing. The next one will be at the end of what passes for Autumn here. I do have an 8th Edition in May, put on by some mates who have a podcast. I'm going to have to see if I still have templates for that game hey.